As a lifelong New Yorker, Shawn Warren’s jewelry embodies that cool, understated chic you find on the streets of Manhattan. Raised around the fashion world by a mother who modeled for top fashion designers of her day, Shawn began her own career as a psychotherapist. She traveled widely, built an art collection and private practice, but remained intrigued by fashion. Eventually, she began designing herself, launching her jewelry business in 2003. Shawn’s jewelry is bold but never over the top, made to fit and flatter a woman on the go. From the eye-catching statement jewels she designs herself to more accessible production pieces, Shawn Warren jewelry is always about accessorizing, not status. Today I’m talking to Shawn about the limited-edition jewelry that has become her signature. You work with some interesting gem material. Where do you find your stones? I buy a lot of stones at the Tucson Gem Show. What is so amazing about Tucson is that you have vendors from around the world all under one roof. You can find everything from beautiful colored sapphires from Thailand to rubies from India and emeralds from South America. What do you look for when you shop stones? I look for the unusual. I’ve been in this business long enough that certain stones don’t have the same appeal any more, because you see them everywhere. So I’m usually looking for an unusual color, an unusual shape. I’m very drawn to palettes of blues, grays, and greens. They tend to be the stones that not only sell the best for me, but that I find myself most drawn to. I love the sliced diamond pieces. That seems to have become a signature for you. 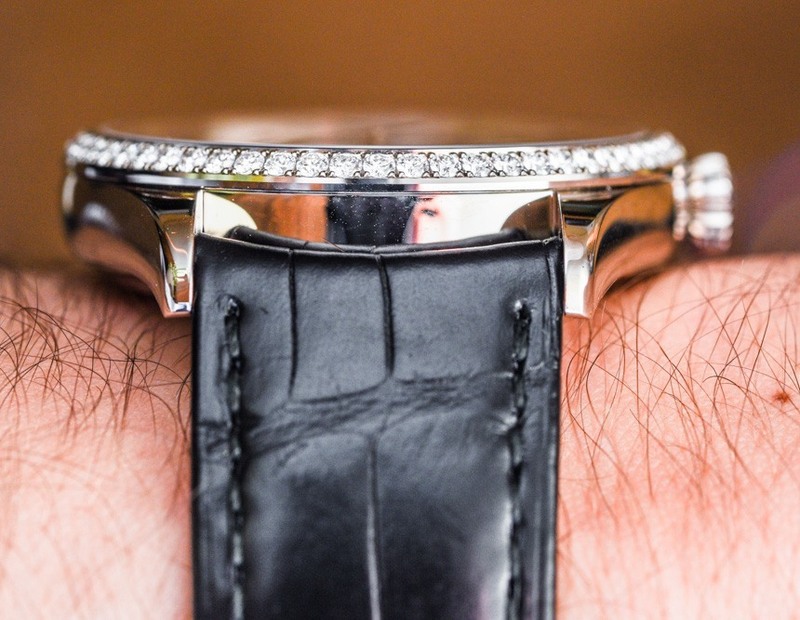 The sliced diamonds are particularly interesting to me because they’re very organic. Each one has its own story and the price point is much more compelling than a traditional cut diamond. You can get a lot of look and value. Most people I sell to don’t want to wear the same thing as their best friend. They want something a little unusual. So if you were to get a pair of diamond slice studs, chances are the shape would be unique. It lends a little individuality. What kind of woman wears Shawn Warren jewelry? She’s a woman who really likes fashion but is not necessarily looking to broadcast her brand. She’s more discreet. She has a bit of a downtown edge, likes to wear jeans with a great pair of boots. She probably has the newest bag but it’s more likely to say Loewe than Celine. She’s worldly and smart. She exercises. We have a page on the website that describes our philosophy and one of the phrases is “perfectly imperfect.” I like that motto. On your website, you refer to your mother as your muse. Tell me about her. My mother modeled for Geoffrey Beene, Halston and Kasper in the fifties. She very much embodied the kind of woman I just described – confident and comfortable. She wore jeans a lot, a woman before her time. She liked beautiful things but preferred them to be under the radar. What would she think of your jewelry? She got to see a little of it. She would always tell me straight out which pieces she loved and which pieces she hated. [laughs] She didn’t have a great filter! I think she would have appreciated what’s become of my business. If we met for lunch, which pieces might you be wearing? I’m loving these lariat necklaces. You can wear them with many different necklines because you can adjust them up or down. I’m going to do them in a lot of colors, but I tend to prefer more monochromatic pieces myself. I might wear my signature large oval cuff with the black diamonds. It fits really well, grips the wrist and doesn’t move around. And I love the idea of the floating diamonds so I might wear that Teardrop ring. Another design I’m wearing a lot are the big Portia fan earrings. That top piece fits into your lobe and the triangle extends below. Your jewelry looks very easy to wear. I think a lot about wearability. I prefer jewelry that doesn’t call too much attention to itself but adds some dimension to your jeans or your blazer or the nike jordan shoes. The way women dress now is not so much about special occasion. They want something they can wear day to night, that they’ll be able to get a lot of use from. My jewelry is not just going to sit in a safe somewhere. One of the favorite coins in my collection is one of tiniest. The half dime was authorized under the Coinage Act of 1792 as the smallest silver denomination. The weight of the coin was just 1.35 grams, which was later reduced to 1.34 grams. The diameter was a 15.5 mm, making it both smaller and thinner than the dime. I came across this 1829 half dime, which was graded NGC AU 53 in an old holder. While the scan above does not convey completely, the coin is covered in colorful, original toning. Furthermore, the coin displays much greater detail and minimal wear than the grade level would suggest. As a premium example for the given grade, I decided to mark the purchase. I sent the coin to CAC and it received their gold sticker, indicating that the coin exceeded their standards for the given grade level. Slowly but surely I will attempt to build a collection of the Capped Bust Half Dimes in similar grade and quality. The series is relatively short lived, running from 1829 to 1837. This makes for only nine different dates to acquire. There are no significant key dates for the series so all coins carry a modest price tag for about uncirculated coins. It's not the most popular series, so not every dealer has a lot of examples available. However, I am sure I will be able to pick up an outstanding coin or two in the coming years. 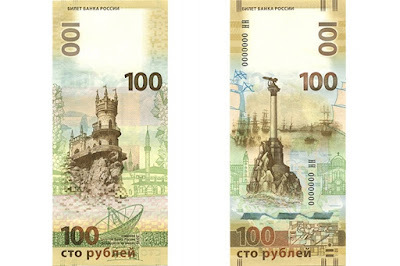 The Central Bank of Russia is issuing new 100 ruble commemorative bank notes that feature the federal cities of Sevastopol and the Republic of Crimea. Nearly two years ago, the Ukrainian peninsula of Crimea was controversially "reunified" with Russia by way of well equipped, organized, and trained "self-defense units" that were actually Russian special forces. The operation to seize Crimea began on February 27, 2014, when an unidentified task force captured several government buildings including the parliament in Simferopol. Within a month, a treaty was signed to annex Crimea and turning the peninsula into a Russian forward operating base. The Coinage Act of 1792 authorized the construction of a mint building in Philadelphia and also authorized the production of coinage in ten different denominations. One of these was known as the half eagle, representing $5 and containing 123-6/8 grains (8.02 grams) pure or 135 grains (8.75 grams) standard gold. The coins were to carry an image emblematic of Liberty on the obverse and the figure or representation of an eagle with the inscription "United States of America" on the reverse. The half eagles would actually represent the first gold coinageofficially struck by the United States Mint. The designs, which would also match the other gold denominations, featured a bust of Liberty on the obverse wearing a turban or cap. The reverse featured a small eagle within an open wreath with the required inscription surrounding. As can be imagined these early gold coins are today quite scarce. This is due to low mintage levels and also a fair amount of melting which took place. At various times, the market value of gold exceeded the face value of the coins such that they could be profitably melted down. Future series of half eagles would carry similar designs, with interpretations of Liberty by a number of different engravers. The longest running image was designed by Christian Gobrecht for the Liberty Head type issued from 1839 until 1908. The final series for the denomination was the Indian Head type designed by Bela Lyon Pratt with an incuse design featuring a Native American. It’s Gemstone June here on the Etsy Blog, which means that we’ve had all things gem-related on the brain! So far we’ve coveredfinding the perfect engagement ring, our favorite gemstones (opal, chalcedony, and turquoise, anyone? ), and how to make a crystal planter, and we’re just getting started. Be on the lookout for more about birthstones, rare stones and jewel tones. To wrap up the week, we thought it would be nice to share some recent gems (pardon the pun), as well as some oldie-but-goodie blog posts. Enjoy! Putting an (ethical) ring on it. Check out this silver druzy quartz ring. Shimmery! Engagement rings to make your heart sing. 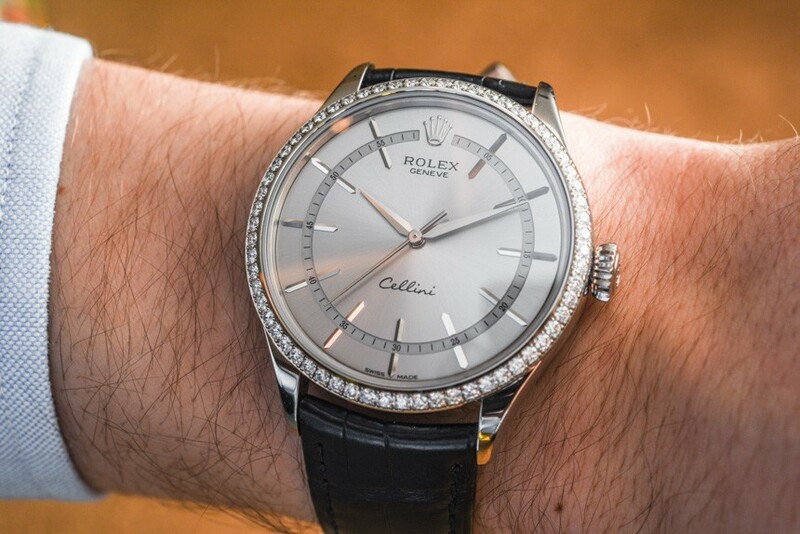 It is actually a pity that I don’t personally have more occasions to wear a timepiece such as the Rolex Cellini. Very much distinct from the famed Swiss watch maker’s more sporty products, this is the formal-blood of today’s Rolex brand. 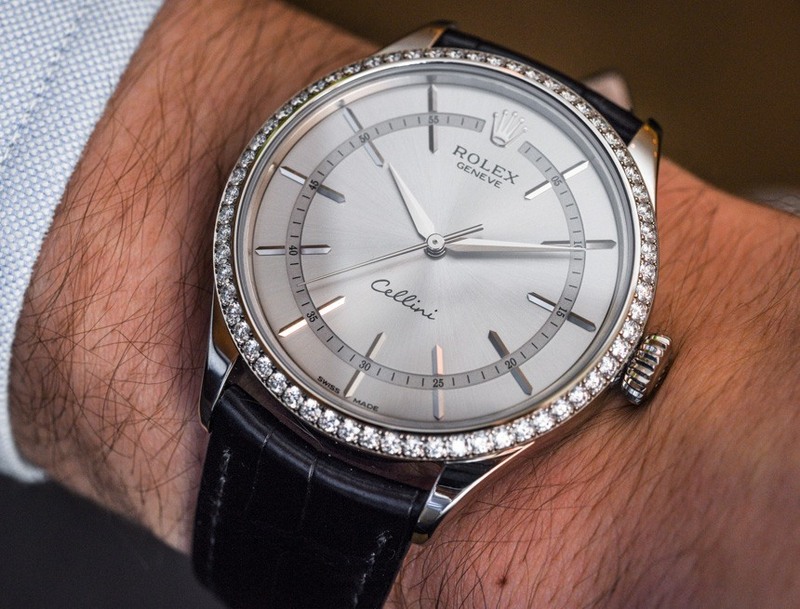 When Rolex recently debuted a brand new version of the Rolex Cellini dress watch collection in 2014, they didn’t just offer one new watch, but a trio of models that would later be further subdivided into the family of (often only slightly different) collection pieces. 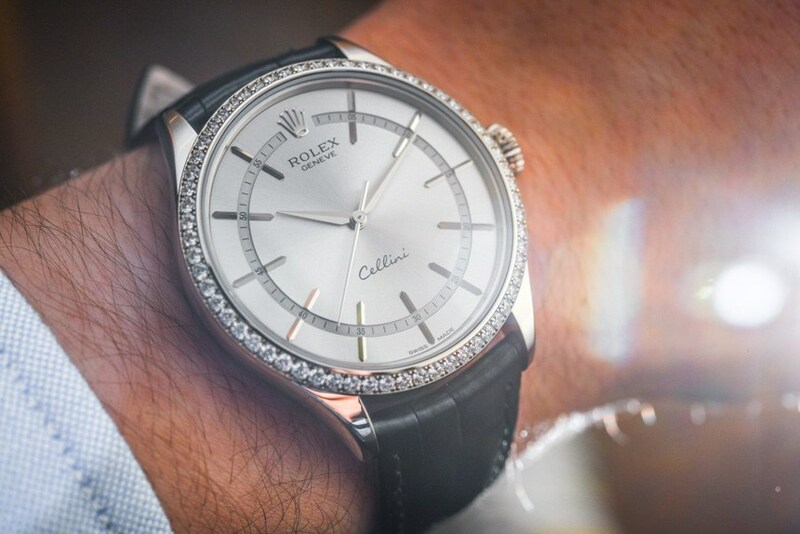 The simplest version of the new Rolex Cellini is the “Cellini Time,” and it indicates just the time with central hours, minutes, and seconds hands. 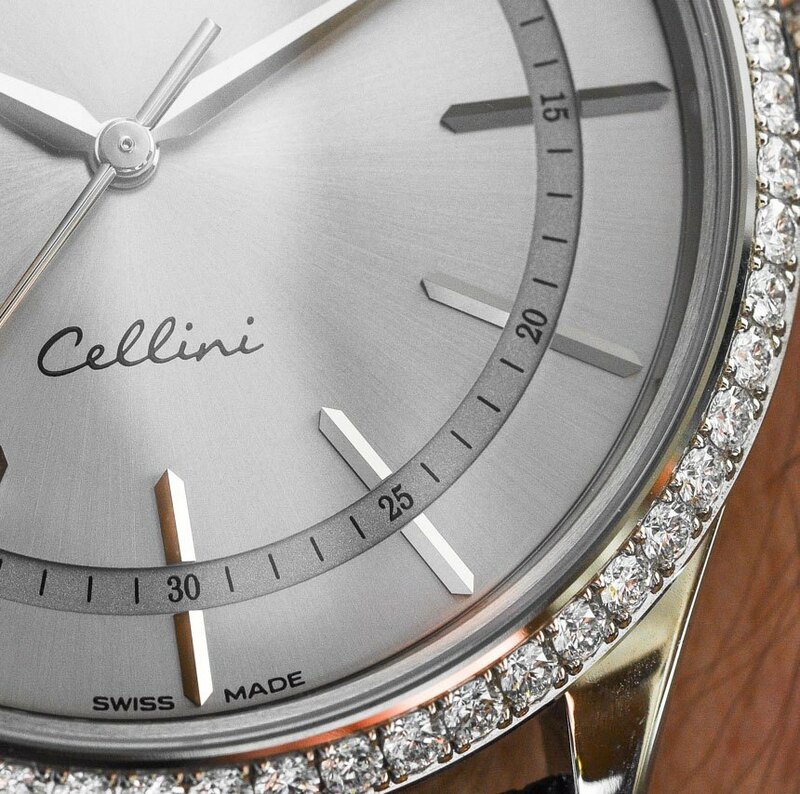 So why is the Rolex Cellini Time a solid timepiece when you want to both feel exclusive and celebrate – especially when it comes to this model with diamonds? In this context, “exclusivity” more or less means “luxury priced.” It implies that few people can own it, either because of cost or rarity. Rolex timepieces might not be rare in the context of timepieces, but the ability to afford one is rare when taking into consideration the volume of disposable income most people in general have. 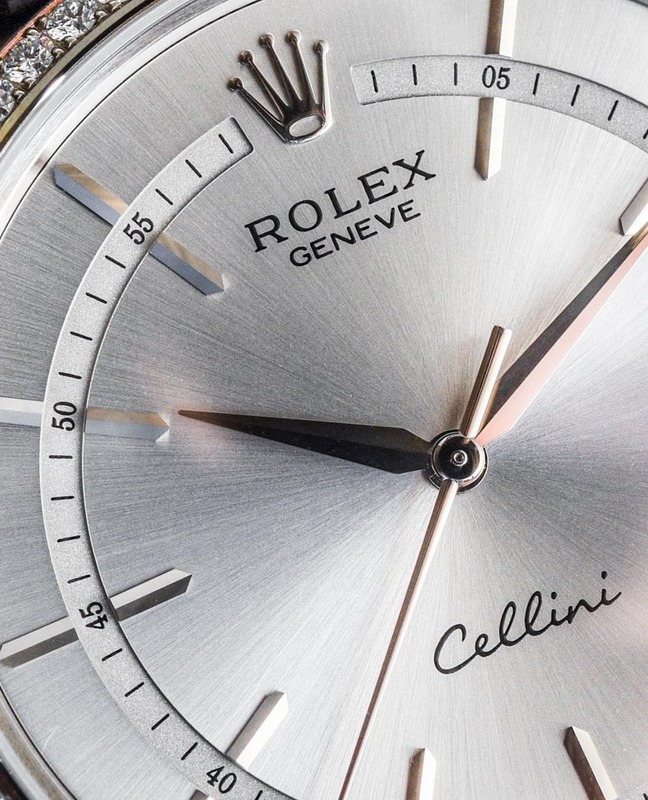 Even in the context of high-end timepieces, dressy Rolex watches are uncommon because Rolex buyers tend to stick with buying more traditional models such as a Submariner or Datejust before venturing out to purchase more niche models such as the Rolex Cellini. The U.S. Mint has shared images of its upcoming 2016 National Park Service Commemorative coins, due for release on March 24. The N.P.S. commemorative coin program was authorized by Public Law113-291 and will include Proof and Uncirculated versions of three distinct issues: a five-dollar gold coins, a one-dollar silver issue, and a clad half dollar. Color-coded images providing more information on the finishes on these coins can be viewed here. 2016 N.P.S. Commemorative $5 Gold Proof Coin. 2016 N.P.S. Commemorative $5 Gold Uncirculated Coin. The obverse of the $5 gold coin features profile portraits of John Muir and Theodore Roosevelt, with Yosemite National Park’s Half Dome pictured in the background. Inscribed along the rim of the coin are LIBERTY, 2016, and IN GOD WE TRUST. Its reverse features the N.P.S. logo and the inscriptions UNITED STATES OF AMERICA, E PLURIBUS UNUM, and the coin’s $5 denomination. Don Everhart designed and sculpted both the obverse and reverse of the coins. 2016 N.P.S. Commemorative $1 Silver Proof Coin. 2016 N.P.S. Commemorative $1 Silver Uncirculated Coin. The silver coin’s obverse design, created and sculpted by Joseph Menna, features a depiction of Yellowstone National Park’s Old Faithful geyser behind a solitary bison. The inscriptions LIBERTY, NATIONAL PARK SERVICE CENTENNIAL, IN GOD WE TRUST, and 1916-2016 are placed around the image. The reverse image includes the N.P.S. logo before a Folklórico dancer. Inscriptions are UNITED STATES OF AMERICA, E PLURIBUS UNUM, $1, HERITAGE, CULTURE, and PRIDE. The reverse was designed by Chris Costello and sculpted by Jim Licaretz. 2016 N.P.S. Commemorative Clad Proof half dollar. 2016 N.P.S. Commemorative Clad Uncirculated half dollar. The clad half dollar obverse features a hiker exploring the wilderness and a child peeking through ferns at a small frog. Inscriptions are LIBERTY, 2016, IN GOD WE TRUST, 1916, and NATIONAL PARK SERVICE. The obverse was designed by Barbara Fox and will be sculpted by Michael Gaudioso. The coin’s reverse features the N.P.S. logo, with UNITED STATES OF AMERICA, E PLURIBUS UNUM, HALF DOLLAR, STEWARDSHIP, and RECREATION inscribed around the design. The reverse was designed by Thomas Hipschen and sculpted by Charles L. Vickers. Until the middle of the twentieth century, there was no agreed-upon standard by which diamonds could be judged. GIA created the first, and now globally accepted standard for describing diamonds: Color, Clarity, Cut, and Carat Weight. Today, the 4Cs of Diamonds. A synthetic diamond is man-made, the result of a technological process, as opposed to the geological process that creates natural diamonds. Synthetic diamonds have essentially the same chemical composition, crystal structure, optical, and physical properties of diamonds found in nature. Most synthetic diamonds are categorized as either high-pressure, high-temperature (HPHT) or chemical vapor deposition CVD diamonds, depending on the method of their production. Since HPHT and CVD diamonds are virtually identical to natural diamonds, differences only become clear when they are viewed by a trained grader in a gem laboratory. How does a GIA Diamonds GIA tests every diamond to determine if it is natural. If a diamond is found to be laboratory-grown, GIA issues a Synthetic Diamond Grading Report, which looks distinctly different from the the standard grading report. As an added precaution, GIA also laser-inscribes the diamond's girdle with a report number and a statement that the diamond has been laboratory-grown. Gold Bullion and Fed Hikes. After falling to its cycle lows in July, the gold price had advanced nicely and last month we wondered whether the positive trend was sustainable. The short answer is: No, it wasn’t. In November, the gold price fell to new 5.5-year lows at $1,052 per ounce, as the U.S. Dollar Index1 (DXY) approached long-term highs. ended the month at $1,064.77 per ounce for a loss of $77.39 (6.8%). On November 4, Bloomberg News reported that Federal Reserve (the "Fed") Chair Janet Yellen said an improving economy would set the stage for a December interest rate increase if economic reports continue to assure policymakers that inflation will accelerate over time. This set the tone for both gold and the U.S. dollar, which fell and rose, respectively, for the remainder of the month. A strong jobs report on November 6, followed by generally positive economic releases throughout the month enabled market consensus to gain momentum for a rate increase at the upcoming December 16 Federal Open Market Committee (FOMC) meeting. Gold bullion exchange-traded products (ETPs) saw 1.59 million ounces (49.3 tonnes) of redemptions in November which drove gold ETPs’ combined holdings to a new cycle low of 47.92 million ounces (1,490.3 tonnes). During November gold equity indices fell with the gold price and nearly met the lows set in July. The NYSE Arca Gold Miners Index2 (GDMNTR) declined 8.5%, while the Market Vectors Junior Gold Miners Index3(MVGDXJTR) fell 8.6%. Low gold prices caused investors to largely ignore the robust results of the third quarter earnings season. BMO Capital Markets reported free cash flow of $978 million from the North American senior miners, far surpassing expectations of $94 million. Scotiabank’s universe of senior and larger mid-caps had production that was 3% above expectations and all-in mining costs that were 8% lower than expected. The favorable results stemmed from operating efficiency, bear market pricing for materials and services, low local currency values, and low fuel prices. Many companies have indicated that there is still room to cut costs further. We now expect positive production results and cost-savings to continue in 2016. Physical demand for gold bars, coins, and jewelry improved in the third quarter. The World Gold Council (WGC) reported that Q3 gold demand increased by 8% over Q2 and by 14% over last year. Year-to-date demand is up 3% versus the same period in 2014. The WGC reckons that there was a gold market deficit of 56.0 tonnes in Q3. The largest drivers of this strong demand were India and China, where demand increased 13% in each country which equates to a 58.0 tonne increase over Q2. Chinese demand continues as physical deliveries from the Shanghai Gold Exchange through November have now surpassed the record set in 2013. For commodities other than gold, strong physical demand drives prices higher – prices follow demand. With gold, the current price drives physical demand – demand follows prices. Lower prices entice buyers in India and China. They also bring strong retail demand from the U.S. and Europe. This physical demand increases when prices drop, helping to stabilize prices. However, physical demand usually diminishes when prices increase. Investment demand generates price strength in the gold market and a lack of investment demand characterizes bear markets. The motives that drive both physical and investment demand are the same – to utilize gold as a store of wealth and a hedge against currency weakness, tail risk4, or financial stress. However, investment demand manifests itself mainly in the futures market in New York and the over-the-counter market in London. These markets exert the largest influence on gold prices and they are driven more by macroeconomic, financial, and geopolitical events than by prices and supply/demand equations. Gold ETPs are relatively transparent vehicles that we use as a proxy for broad investment demand. In Q3 global bullion ETPs had 63.0 tonnes of redemptions. This is probably a good indicator of weak investment demand in New York and London. It also lends better insight into price action than physical demand from China or elsewhere. We believe that physical demand should play a larger role in price discovery, and maybe it eventually will as the Asian gold market grows and matures. In the meantime, the Chinese seem happy to accumulate all the gold the West cares to provide at low gold prices. Regardless of what we believe should happen, we make investment decisions based on what actually drives the market. This means investing in companies that can survive intact or gain an advantage if a lack of investment demand drives prices lower than expected. Once again the markets are essentially convinced that the Fed will raise rates at the next FOMC meeting. Based on recent Fed comments, economic releases, and the level of expectations, we will be shocked if the Fed doesn’t raise rates. Rate rising cycles introduce risks to the economy and financial system and they often end badly. According to Gluskin Sheff5, a bull market in the S&P 500 Index6 has never ended after an initial rate hike. It’s a different story if the rate hikes keep coming. The stock market crashed in October 1987 after three rate hikes over five months. NASDAQ crashed in April 2000 after six rate hikes over 11 months. Rate increases are often a prelude to recessions, which become increasingly likely as the yield curve flattens or inverts (when short-term rates exceed long-term rates). In the last four decades, the Fed has never raised rates when the Institute of Supply Management (ISM) Manufacturing Index7 was below 50, which signifies a manufacturing recession. The ISM Index is currently 48.6. How long can Fed policies diverge from the rest of the world where the central banks of Europe, China, Australia, and Japan are all easing to combat economic weakness? Every country that started a rate-hiking course after the Great Recession that ended in 2009 was ultimately forced to reverse course.